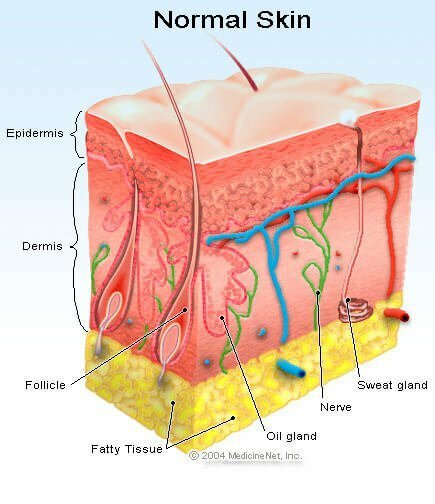 Epidermis: The upper or outer layer of the two main layers of cells that make up the skin. The epidermis is mostly made up of flat, scale-like cells called squamous cells. Under the squamous cells are round cells called basal cells. The deepest part of the epidermis also contains melanocytes. These cells produce melanin, which gives the skin its color. The other main layer of the skin is the dermis, the inner layer of skin, that contains blood and lymph vessels, hair follicles, and glands. These glands produce sweat, which helps regulate body temperature, and sebum, an oily substance that helps keep the skin from drying out. Sweat and sebum reach the skin's surface through tiny openings called pores.